Recently I have been feeling stressed, bloated and sluggish. 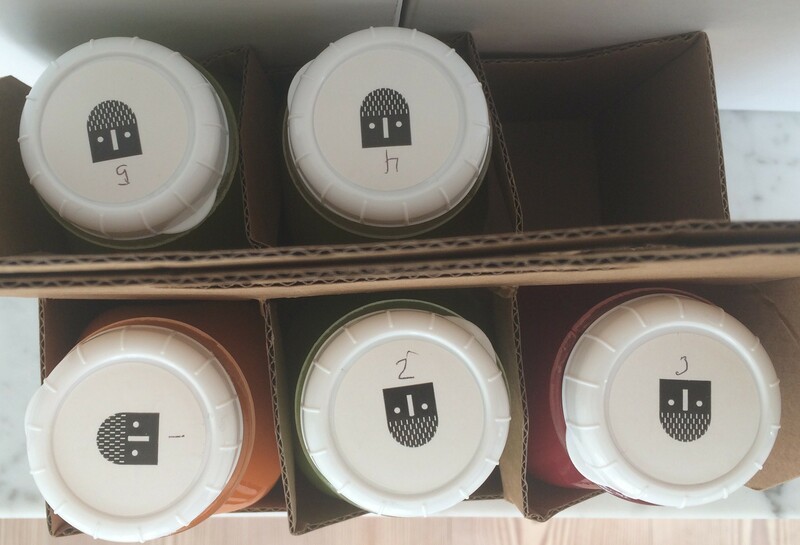 I drink WAY too much coffee and in an attempt to reduce my coffee intake have been dropping in occasionally to a new juicery near where I live. This isn’t the kind of juice depot that my kids love, no piles of ice cream and sugar disguised as healthy options. No this is the real deal: cold pressed nutritious pulp-free juices and super food smoothies that contain only raw organic fruit and veg. This does not mean they are not tasty, they are (or rather they are to me, my daughter still pulls a face when I ask her if she would like some, having tried it once!) each one having a different zing or bite to them. 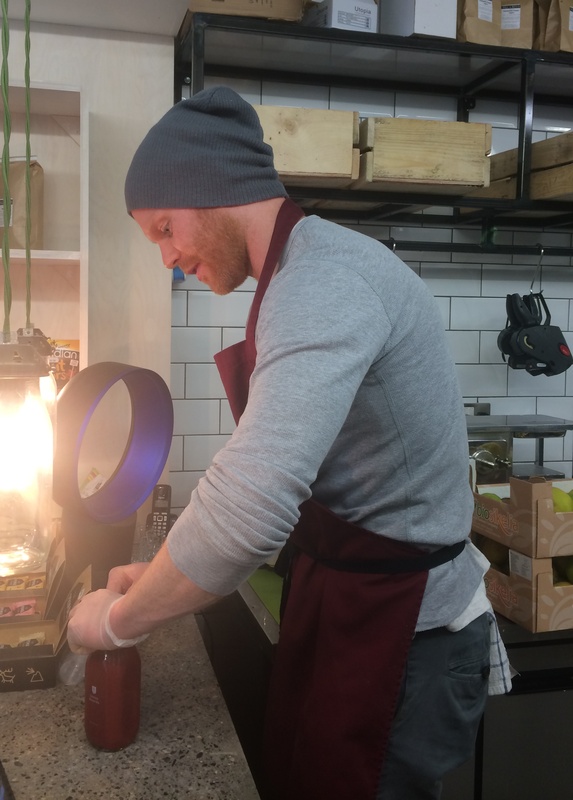 The shop is called Green Beards and it is newly opened by partners Raymond O’Hara and Kevin Johnston in Dunville Avenue in Ranelagh, Dublin. They have 2 size bottles of their juices: regular (250 ml) costs €4.50 and the large (414ml) costs €6.50. Having noticed a difference in my well-being from having just one juice a day I decided that I would take the plunge and partake in their 3 day body cleanse regime in order to kick start a new healthier me. The idea is that your body gets rid of lots of toxins and you feel fresher lighter rejuvenated. 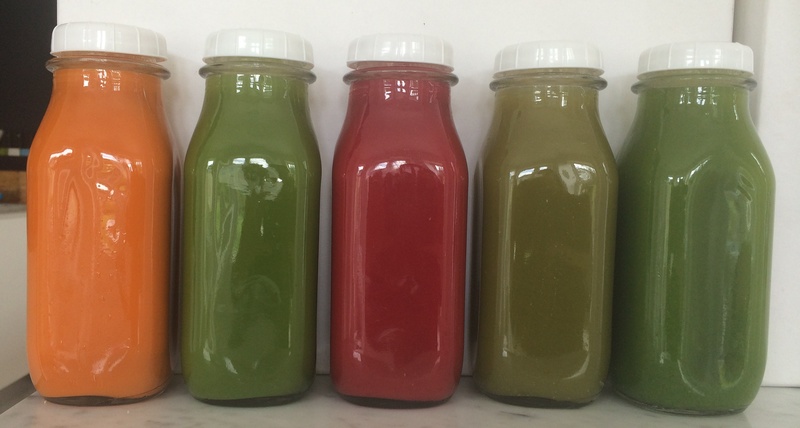 This Deep Clean juice cleanse package involves having 5 of the 414ml bottles a day, 2 of which are root based and 3 containing greens which are outlined below. The cost of this deep clean package is significant (at €85) but with this significant cost comes Significant Guilt, therefore there was no way I was going to cheat. (I also reckon it could actually cost me more to buy the substantial amount of fruit and veg that would be required for each one, not to mention the equipment and the time factor of shopping and making) They also do a one day juice package: The Wash (€30), ideal for people who are interested in trying the benefits of juice detoxing without having to make a 3 day commitment. Ok, so now I’ve committed to this madness. They say that the cleaner your diet is before you do the cleanse, the easier the process will be. Less of a shock to the system, I guess. Giving myself only 24 hours notice I decide to forego coffee and alcohol, substitute lunch with juice and have a light seafood dinner. Not much but I hoped it would be better than nothing. I collect my days supply in the handy carry pack. Each one is numbered to indicate the order in which to drink them but they say you can switch them around, it’s up to you. The most important thing is that you drink them all! The first problem I encounter is a serious one. I can’t get the lid off the first bottle. After much twisting and pulling I eventually get a spoon and manage to get it off but end up spilling some over my (white) jeans. By the third bottle I have gotten the knack of using the spoon without the spilling problem. (I have since been assured that new lids are on the way and that this will not be the case for long). Breakfast is the Wanderlust (the orange one) and is actually very filling. I used a small straw and drank it over a fairly prolonged period of time rather than gulping it back in one go. Next on the menu was Northern Lights (one of the greens) and was lighter and more refreshing that the heartier earlier one. My personal favourite was the Beets by Ray (the, well, beetroot coloured one) although I did enjoy each and every one. I hit the wall mid-afternoon on the first day. It may seem obvious but willpower is required! I struggled through to dinner time but found it difficult to even think about cooking for the rest of the family. Having to continue to provide meals for the family was without doubt the hardest aspect of the three days. So it was an uninspiring freezer dinner for them. By now I am getting really used to the whole thing. I am not hungry at all but realise that I have not being drinking enough water and am extremely thirsty. I expected headaches (especially from caffeine withdrawal) and hunger but this did not happen, obviously because of the immense amount of nutrition that my body is being fed. By the evening of the second day I am feeling so in control of things that I actually cook a decent meal for the family. One that involves chopping and sautéing and delicious smells and even with that I am not tempted. I do however draw the line at sitting and watching them eat so I take my juice bottle to the computer and start to write this post, more as a distraction than anything else. This was not part of my original intention. I then realise the other thing that I really miss is the social interaction that meals involve, another unexpected reaction. However lets not get too carried away here, we are only talking 3 days after all! The first two evenings I stayed in and watching the World Cup (seriously, who knew I could get excited by 7 goals, although it did help that I drew Germany in the family draw) ; trying to occupy the hours with distraction therapy. By nightfall I am feeling pretty pleased with myself having got this far. By opting to collect my bottles each day I now realise that the daily interaction with Ray and Kevin is really encouraging. 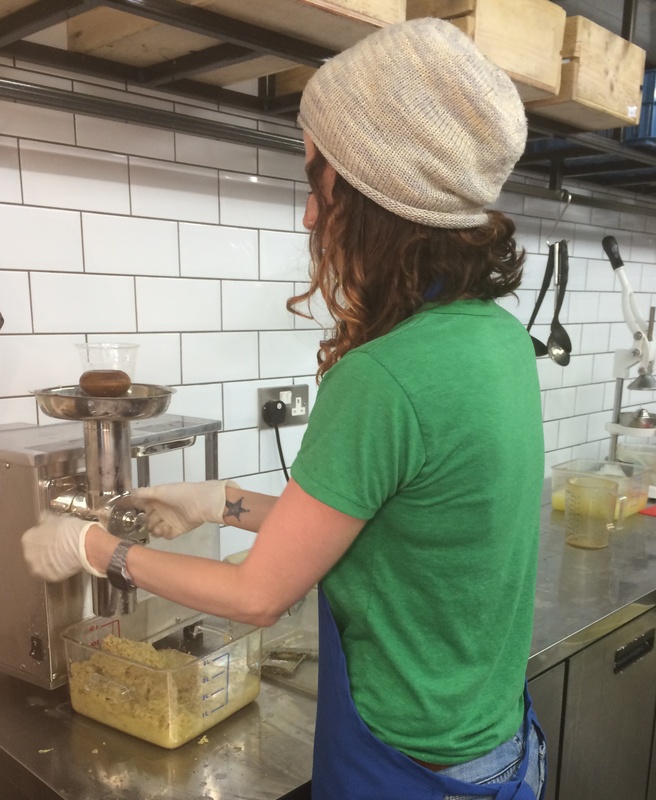 They are really passionate about what they do and the busy and industrious atmosphere of chopping and whirring gives a feel-good factor that makes me feel like I have an invisible halo over my head while I am in the store. For me the shop design is also an important aspect in making it attractive for customers to enter the store. 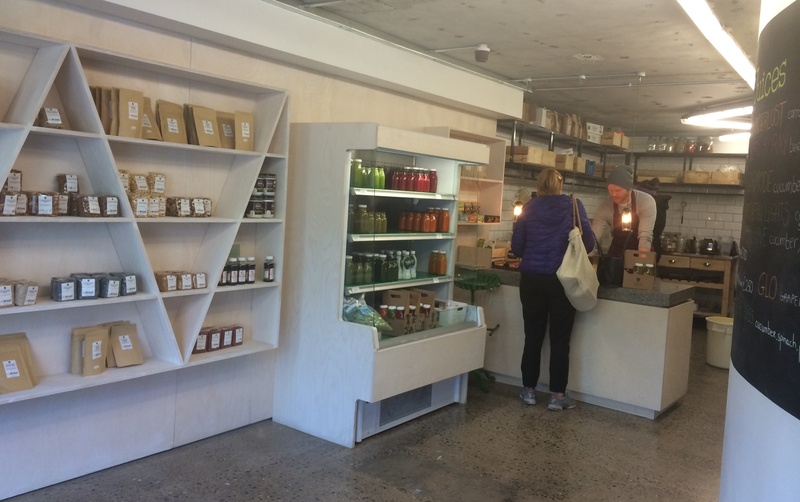 In the retail area the walls are white with painted on blackboards displaying the range of superfood smoothies and juices and fridges carry pre-made bottles. The kitchen area consists of white metro tiles which combine well with steel shelving. 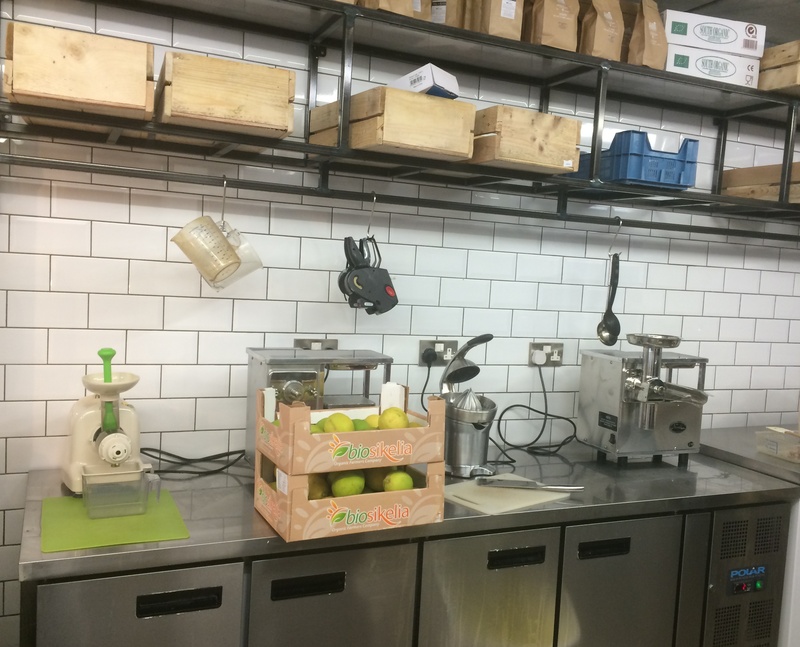 These and the stainless steel worktop are offset nicely by rustic timber boxes containing produce. Lighting is in the form of old style filament bulbs which give an industrial edge together with the polished concrete floor. 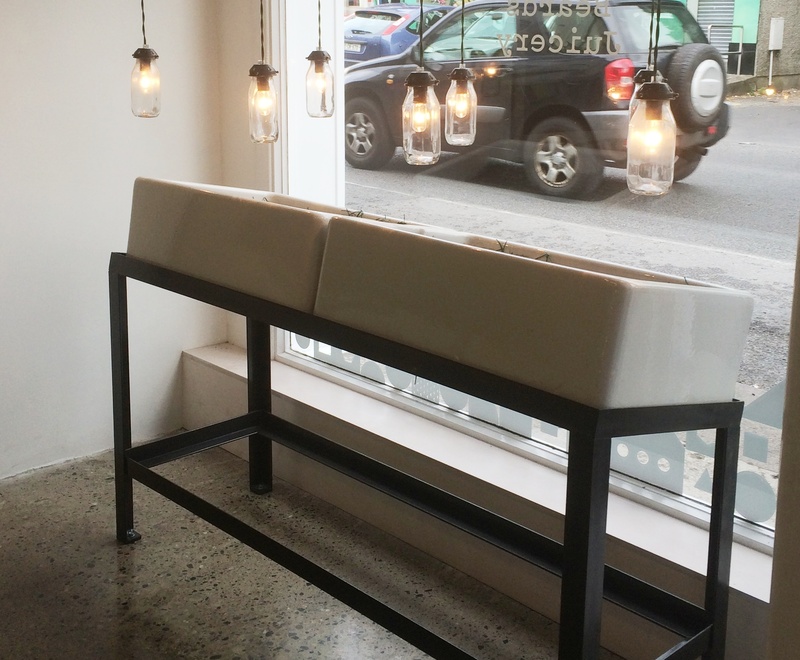 The shop design was a collaboration between Architect Stephen Mulhall and designers Séan Mongey and Robert Farrelly and for me the combination of materials works. The window contains an array of filament bulbs hanging over two “Belfast” sinks which currently contain some blackboards with information regarding the type of product they provide. 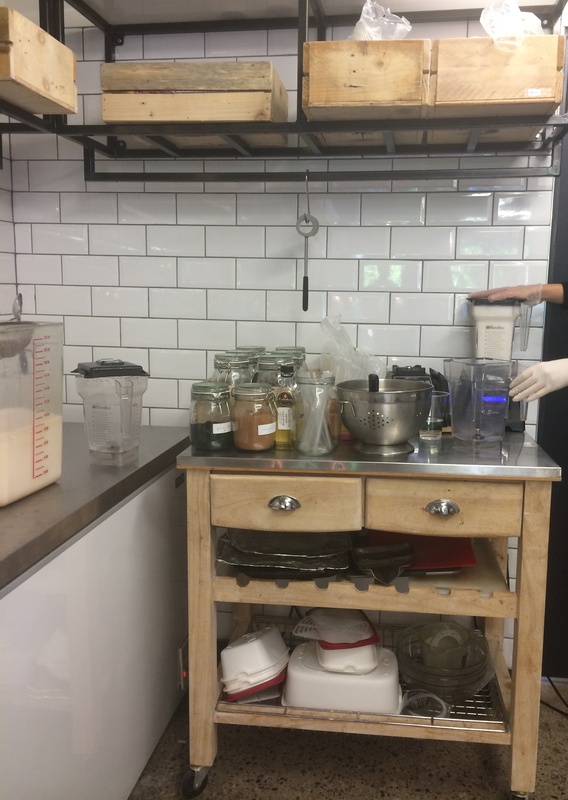 It seems a bit of a missed opportunity for displaying some of the fruit and vegetable or other raw ingredients which look great in the kitchen area. The later part of the third day was harder than expected given that the end was in sight so I decided to go to the cinema. Off we went into the Irish Film Institute to watch the movie “the 100 year old man who climbed out the window and disappeared” and I found myself salivating over the Russian gruel and wishing I was nearer the exit to use the bathroom. After 3 days of liquids only it was almost cruel to watch a movie with an unprecedented number of scenes of men peeing against walls! It’s done and I feel a personal sense of achievement. I feel more refreshed and more in control of my body and well-being than I have for a long time. Although I set out to do this to feel better rather than to lose weight, I am not complaining that I have lost somewhere between 4 and 5 lbs. Bizarrely I don’t want this to end. Did I think I would be like that 4 days ago? Definitely not. I am looking forward to a coffee but maybe only one before 10am and not 2! I head back to buy my favourite juice for breakfast. Would I recommended it? Definitely. Will I do it again? Absolutely, maybe a couple of times a year. The end result is: I feel healthy, l lost weight, I did not feel hungry. 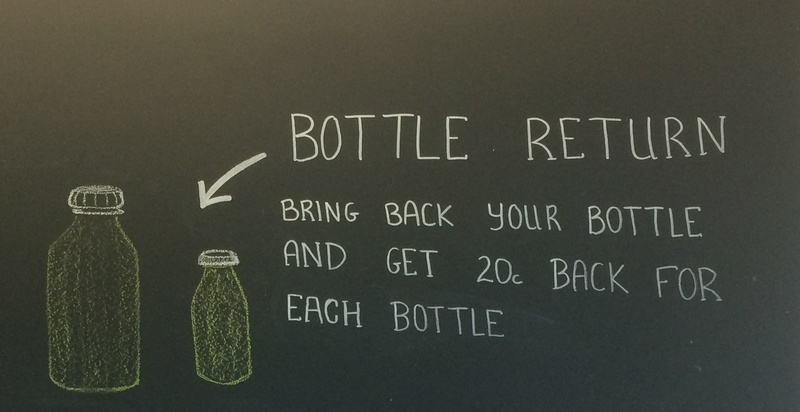 The stylish glass bottles are recyclable or returnable. 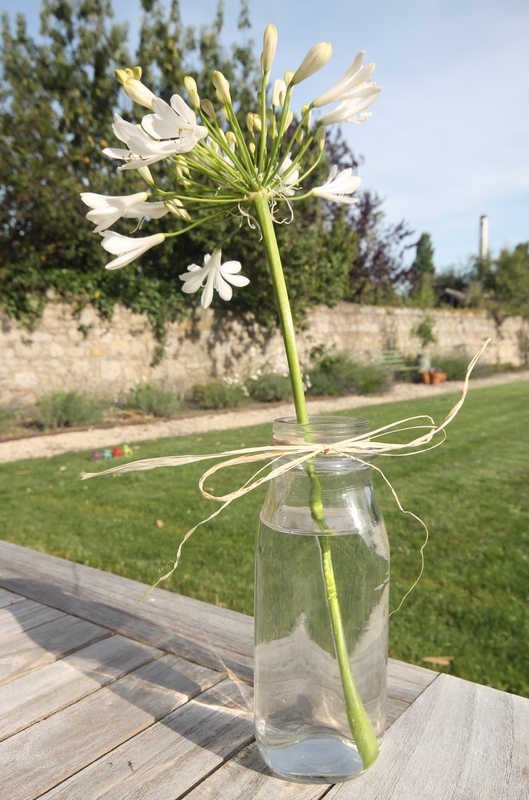 Or you can always keep some and use them for flower display as I did. 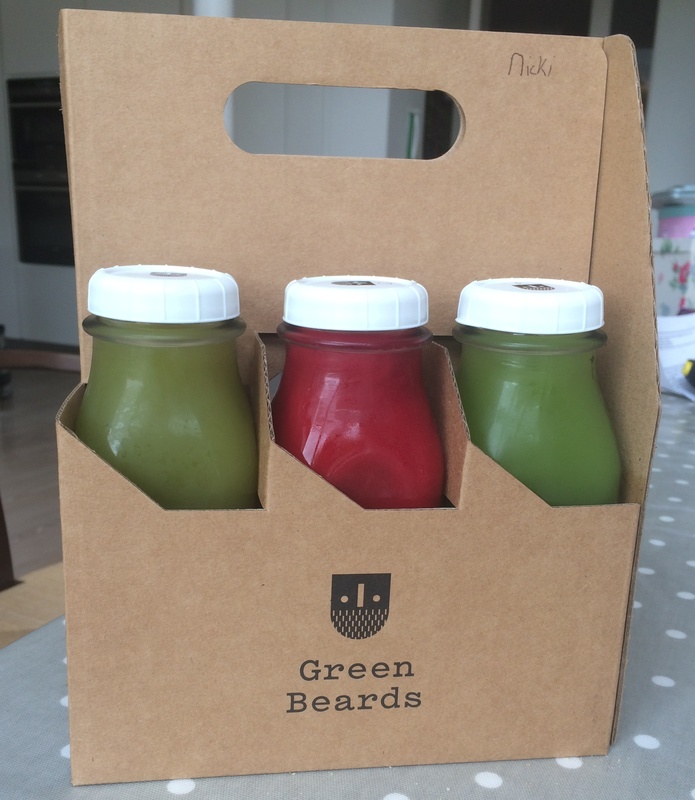 Green Beards Juicery, 23 Dunville Avenue, Ranelagh, Dublin. Opening hours: 8-6 Monday to Wednesday, 8-7 Thursday and Friday and from 9-5 Saturdays and 10-4 Sundays. This entry was posted in Food and tagged 3 day juice diet, irish film institute, juice detox by Passionate about Design. Bookmark the permalink.